PENSACOLA, FLA - According to a recent NAHB study of home buyers, a full bath on the main level of the home is the top accessibility feature desired by every age category surveyed --- Millennials, Gen X, Baby Boomers and Seniors. A whopping 86 percent of respondents identified a full bath on the main level as "essential" or "desirable" when looking to purchase a home. The September 2015 study of thousands of consumers nationwide conducted by the Home Improvement Research Labs* shows a breakdown that 93 percent of Seniors surveyed want a full bath on the main level. When broken down by age designations, 86 percent of Baby Boomers had the same desire for a main level bath, followed by 78 percent of Gen Xers and 76 percent of Millennials. "This overwhelming desire for full bathrooms on the first floor aligns with the evolving trend of preferences for first floor master bedrooms," says Roger Murphy, president of Hy-Lite, a U.S. Block Windows Company. "The challenge is that no homeowner wants to worry about constantly closing window treatments or pulling down shades to protect their privacy in a main floor bathroom that looks out on the street or a neighbor's yard. "With the clear preference for first floor master suites, the pressure is on builders to find ways to protect homeowner privacy from the prying eyes of neighbors and passersby." Murphy believes privacy windows are the solution. "Both obscure decorative glass and acrylic block windows allow light to flow into the bathroom while assuring a homeowner's privacy," says Murphy. "These designer windows come in both fixed and operable styles, so it's still possible to ventilate the bathroom while keeping it a private oasis for a homeowner without the need of window treatments." 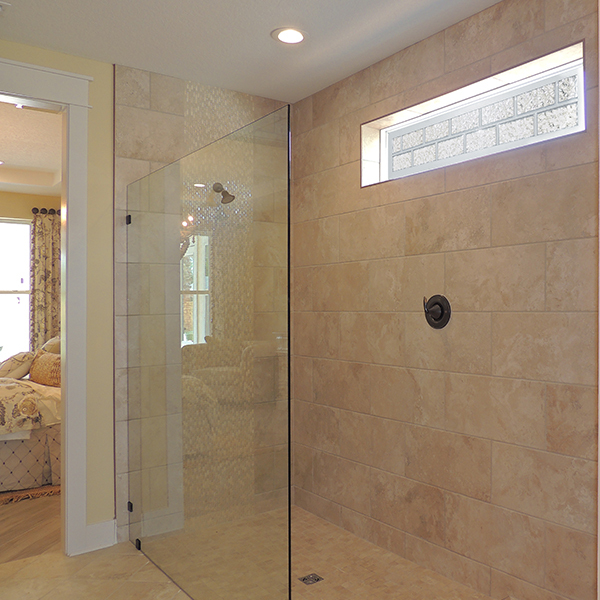 For aging Baby Boomers and Seniors looking to create easy-access bathrooms with effortless accessibility, Murphy recommends private shower wall enclosures made of obscure acrylic block panels. Both flat and radius pre-fabricated walls are available to help builders create low-threshold shower areas in the master bath. According to Murphy, the newer trend of spa showers in the master bathroom can also benefit from having privacy windows incorporated into their design. "Decorative windows are available in 4' by 1' sizes that can be added high above in a shower to add light into a master spa center," says Murphy. "While a 4' by 4' size can be ideal for a large space over a tub, other sizes --- including a 3' by 5' window --- are available to enhance the design of all spaces of the master suite, including a walk-in closet." *Housing Preferences of the Boomer Generation: How They Compare to Other Home Buyers. Produced by the National Association of Home Builders (NAHB) Economics & Housing Policy Group. Results are based on 4,326 responses to detailed questionnaires.